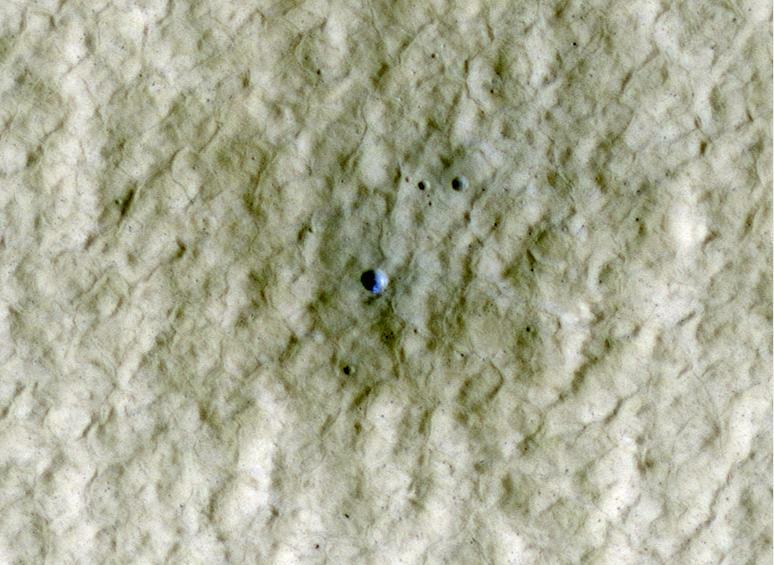 At the center of this view of an area of mid-latitude northern Mars, a fresh crater about 6 meters (20 feet) in diameter holds an exposure of bright material, blue in this false-color image. 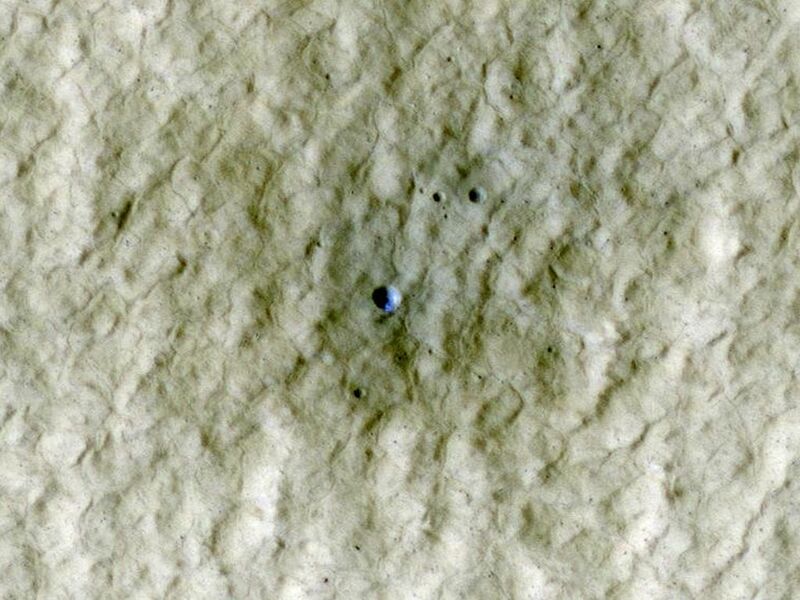 The High-Resolution Imaging Science Experiment (HiRISE) camera on NASA's Mars Reconnaissance Orbiter made this observation on June 20, 2010. Previous HiRISE images of fresh craters in the middle to high northern latitudes show exposed water ice on the poleward-facing slopes (see: http://www.nasa.gov/mission_pages/MRO/news/mro-20090924r.html). Here is another example. 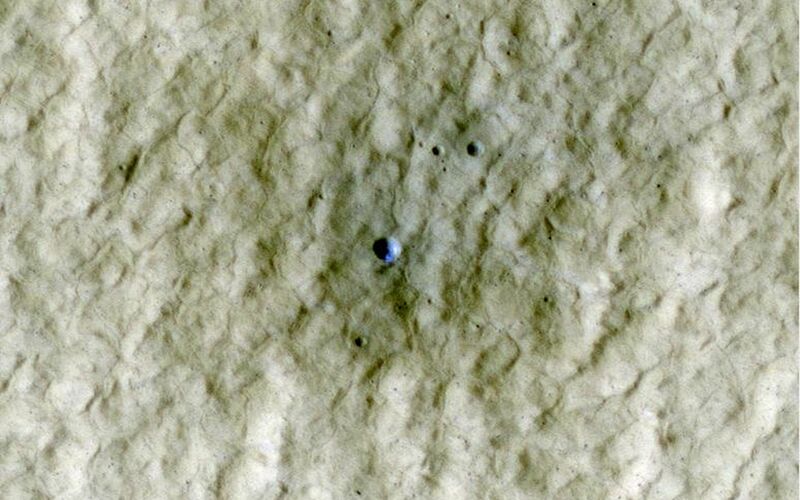 This crater formed sometime between April 2004 and January 2010, as determined from before-and-after images acquired by the Thermal Emission Imaging System camera on NASA's Mars Odyssey orbiter and the Context Camera on the Mars Reconnaissance Orbiter. 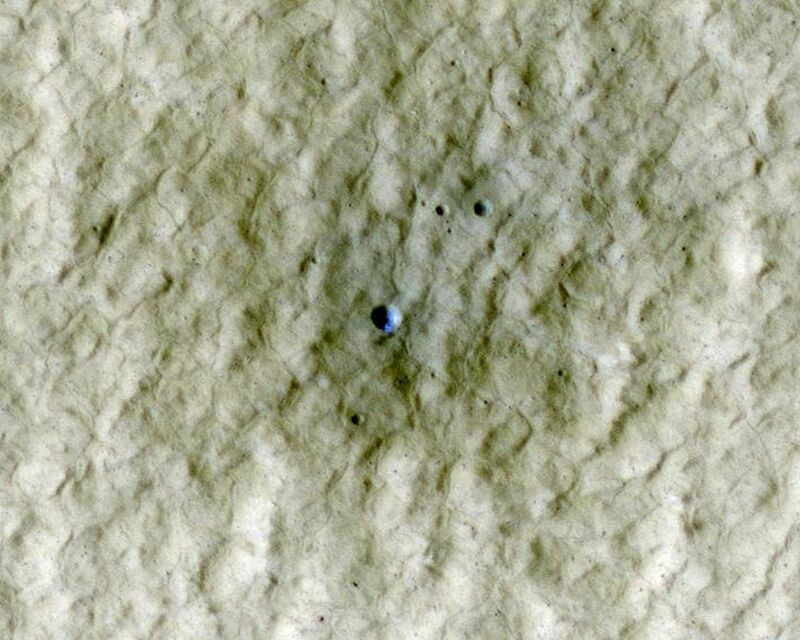 This HiRISE image was acquired in northern Mars' early summer, when frost at this latitude is not expected. Scientists propose that the bright material at the crater is subsurface ice exposed by the impact that excavated the crater. This image spans a distance of about 170 meters (about 560 feet) and is presented in false color, which aids in distinguishing among surface materials and textures. It is a portion of the HiRISE observation catalogued as ESP_018273_2245, of an area at 44 degrees north latitude, 180 degrees east longitude. NASA's Jet Propulsion Laboratory, a division of the California Institute of Technology in Pasadena, Calif., manages the Mars Reconnaissance Orbiter for NASA's Science Mission Directorate, Washington. Lockheed Martin Space Systems, Denver, built the spacecraft. The High Resolution Imaging Science Experiment is operated by the University of Arizona, Tucson, and the instrument was built by Ball Aerospace & Technologies Corp., Boulder, Colo.